GP: One of our concepts that we’re focusing on in this series is player interactions. My favorite mechanic in Karmaka is the “goes around, comes around” idea of karmic retribution. How did you balance the design to encourage interaction rather than incentivizing players to just hang on to their own cards? Choosing to play a card for its ability comes at a ‘karmic cost’. Specifically: after doing what the card says, you must offer the card to your rival, who can then take the card into their Future Life or ruin it (send it to the discard pile). This is the ‘What goes around, comes around’ quality: the actions you take in this life may come back to haunt you in the next life — depending, of course, on how your rival decides to play the card next life; they may choose to score it as a Deed instead of playing it for its ability. So back to your question: given these three ways of playing a card (for points, for ability, or passing to your Future Life), how to balance the cards? Motivating players to pass cards to their Future Life (a.k.a. draft) is achieved by the game’s scoring system (more on this below). In terms of balancing the main tradeoff (play a card for its points? or for its ability? ), you want to keep the tension in the decision and make each card feel like they’re worthwhile playing either way. To achieve this, one must tune the point-value of the card relative to the strength of its ability, so that neither scoring a card nor playing it for its ability is clearly better for a given card. In Karmaka, we eventually settled on having cards of 1pt/2pt/3pt denominations. You want the colors to be equally played, so there are equal numbers of 1pt/2pt/3pt cards in each color. You also want the potency of the ability to be proportional to the point-value of the card. Otherwise, a card with a weak ability but worth a large number of points would likely always be scored, and vice versa. This helps in the readability of the game as well, because new players can get a sense of the strength of the card simply by looking at its point value (3pt cards have more potent abilities than 1pt cards). So in the end, it’s a matter of tuning card abilities to match their point values. We’re actually still doing a bit of tuning; just a few weeks ago, a 3pt green card called Voyage was not seeing enough play for its ability, so we gave it a little tempo-boost. GP: The only similar mechanic I can think of to the card karma in Karmaka is the Operations/Event cards in Twilight Struggle, where you can choose either to play a card for its event or for its operations points. Did you get any inspiration from Twilight Struggle or any other notable games? I do own Twilight Struggle. I picked it up around 2008; not sure if Eddy has played it or not, although we have talked about the game together. Notably, Twilight Struggle borrowed the OpPoints/Event mechanic from Avalon Hill’s Hannibal (a game from the mid-90s). Anyway, in the first iteration of Karmaka in early 2014, everything was very different. Back then, every card had points and an ability (as they do currently) but cards also had their own ‘karma’ ability. Typically, the karma text was flavored to the card, and often either burned you or was a weaker version of the card, for other players. So a 2-point red (nihilistic/destructive) card might say “A rival of your choice trashes one of their Deeds” and the karma would say “You must trash one of your Deeds.” — so both would happen when you played the card. Or a 3-point green card had “Draw 3 cards from The Well” and the karma was “Each other player draws 1 card from The Well.” So when you played the card, you’d place it down in front of you, choose either to score the points or resolve the ability, then finally resolve the karma. So in those days, even scoring points came with a ‘karmic cost’. Anyway, in playtesting we found all this to be too much. It was mechanically interesting, but new players had a lot of text to grok, and the game was slow because you’d have to be okay with everything the card did before wanting to play it (the potential for analysis-paralysis was real). The cards were also tougher to balance in those days as well: you’d have to balance each of the card’s points, ability and kramak against each other. GP: Another emphasis this month is on resource economics: how scarcity and inflation affect the value of resources as the game progresses. What was the biggest advantage of “devaluing” points by requiring more to advance to each subsequent stage of life? Short answer: increasing the number of points players need to score per rung on the Karmic Ladder forces players to curate a Future Life. Early in the game it’s relatively easy to level-up, but in the later stages of the game, ignore your Future Life at your peril. Longer answer: The Karmic Ladder and the whole ‘race to Transcendence’ angle was one of the later developments of the game, after the cards, the turn structure, and many other elements had more-or-less congealed. We were looking to give the game an overall objective. Is the point of the game simply to wrack up points? How many lives should players play? Is it first to some point goal? Most points after N lives? And so on. So the Karmic Ladder was conceived for that purpose, that you need to play out a certain number of lives, and of course the karmic mythos was just begging for reincarnation into other life forms. And so each run of the Ladder must represent a life form, with an objective score to qualify you for reincarnating up a rung or not. So we took a stab at four rungs requiring 4-5-6-7 points, respectively — reach the top first, you win. When you begin the game as a Dung Beetle with a random Hand and Deck of cards, how many points should be required of you for that first level? We ran the stats on the card distribution and realized our initial gut-feeling of starting at 4 was pretty reasonable. Given the distribution of cards in game, the odds of having 6 random cards that will give you 4 or more points in a color, including the Mosaic (wild) cards, was in the 90th percentile — pretty doable, barring any aggression from your opponents. As you need more points (5 for Snake, 6 for Wolf, etc) it becomes harder to have enough points with a random set of cards, and so players are motivated to spend time curating their Future Life. You cannot ignore your Future Life and win against opponents who are paying attention to their Future. GP: On a completely different topic, I’m a big fan of your mobile game Osmos, and I don’t know of too many designers who have been successful with both tabletop games and video games. What is it like to transition between the two? Do you prefer one over the other? The game design is similar… we always approach it from mechanics/core-inner-loop first. In Osmos the physics and the inherent tension of “spend yourself to move” came first and the narrative/theme/aesthetics later. 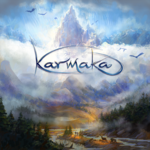 In Karmaka, we set out to make a cardgame with ‘karma’ inspiring as much of the game as possible. The art design came online midway through. One of the most important things about a game is the on-boarding process: getting new players into the game. In digital, you can do a tutorial and smoothly ramp the player into the complexities of the game, one element at a time. In tabletop… either a friend teaches you the game, or you’ve got a rulebook to read first. I love reading rulebooks! But, not everyone likes reading rulebooks, haha. In general one always wants to make games that are easy to learn but that have great depth. I think we managed to do that with both Osmos and Karmaka. The mediums are different, which is a lot of fun. Digital has movement and sound. Tabletop is still, but you have the pleasure of the physical artifacts to hold, the feel of the cardstock, the weight of the elements. Digital and tabletop are different, and both wonderful. From a design perspective: Eddy and I live on different sides of the country, which makes riffing on a physical prototype… challenging. How can we both draw cards from a shuffled deck on a video call? We actually developed Karmaka in a digital boardgame prototyping environment with realtime networking I had written on iOS (this was a couple of years before Tabletop Simulator and the like). And of course lots of local physical playtesting; he with friends in Nelson, B.C. and I with friends in Toronto. GP: Is there any spiritual or thematic link between Osmos and Karmaka? In both games, you’re constantly evolving to reach a more powerful state of being–or is that too much of a stretch? Haha, well, we certainly do like to do games that touch on unique themes, stuff you don’t find as readily in other games. In Osmos, the visuals are soft and translucent, the atmosphere dream-like — the game is an aesthetic experience. In Karmaka, that ‘What goes around, comes around’ concept was just beginning to be an economy for a card game, which quickly dovetailed into notions of drafting a Future Life, etc. All the card identities we’ve directed towards timeless qualities with a very classical, impressionistic art style. So I think the games definitely relate at least in the sense that they’re, hopefully, very unique and very impressive aesthetically. And I think another way they relate is in our desire for the aesthetics, the gameplay, and the theme to all roll together, to enforce one another — that everything feels cohesive, nothing is out-of-place or tacked-on. Are the themes of two games directly related? I don’t think consciously so, but hopefully they do make sense as coming from the same designers. Philosophically, humans are always reaching for the transcendent (we seek out and revere for qualities such as beauty, wisdom, compassion, justice, and so on) and the very definition of life is that which grows/changes/adapts (because, when you atrophy or stop growing, well, you’re dead) so in that sense I think both games touch on some timeless realities of the human experience. GP: Unconventional names for mechanics, objects and ideas in games with heavy thematic motivation can present some interesting responses from playtesters. What observations did you make during play testing surrounding the naming conventions in the game? Karmaka does have a few unique keywords for typical cardgame stuff (e.g. the central draw pile is called The Well; the discard pile is called The Ruins, a scored card is called a Deed, etc.). And there are associated verbs as well, so for example a card might say “Ruin a rivals exposed Deed.” which means a player must put their most-recently-scored card in the discard pile. Anyway, we feel the names work for Karmaka because it really does up the theme/vibe. We’re consistent with the terminology through the game’s rules, cards, etc., and the terms that we’ve chosen make sense (they’re not crazy stretches or arbitrarily-chosen). Also, having names helps the compactness of the card text (see the example above). People pick it up very quickly. Our playtesting has come basic universally positive on this front, so it seems we’ve nailed it. GP: Can you talk about anything else in your pipeline, or are most of your efforts dedicated to Karmaka at the moment? All hands on the Karmaka deck! (pun intended) There are always ideas in the queue, but we’re focused on Karmaka’s crowdfunding campaign and getting the game printed. If you could be reincarnated as any life form, what would it be? I’m happy to be a human. Honestly, because I am one, it’s hard to speculate as to what it’s like to be another species — what their motivations are, and so on. Humans have amazing potential. We are social beings who need each other and can achieve great things together. The psyche and soma, the mind and body — at once transcendent but also physical. Fascinating! What is one idea you feel is underutilized in modern game design? Sound design. It’s always an under-budgeted afterthought, but it is so, so critical in establishing mood. What is one (or a few) games that you feel would make for a great digital implementation? Digital games do different things than tabletop. Software can crunch numbers and do the upkeep/bookkeeping for you (conversely, Tabletop is often about the fun of managing the simulation manually, with physical bits, etc.). Software can also do complex physical simulation, animations, movement, dynamic-pretty, etc. So when I think about games that would do well on digital, I think either about games that I’d like a helluva lot more if I didn’t have to do the painful bookkeeping, or that would really benefit from having the visuals augmented with animations, models, etc. Other than Karmaka, what was the best game you played/saw/talked with the designers about at Boston FIG? Sadly, I was working all weekend, and while I met some great folks, I didn’t get a chance to play anyone else’s game! Nathan Enkel who was there representing Karmaka really enjoyed Michael Orion’s game Aura. Games Precipice has no affiliation with any publishers but from time to time we really like to spotlight projects that we find interesting. We are incredibly appreciative that Dave was willing to take the time to join us and discuss the design and development of Karmaka. At the time of this writing Karmaka by Hemisphere Games has successfully funded on Kickstarter with more more than three weeks to go. We look forward to seeing all the good karma Dave and Eddy continue to bring to life in 2016 and beyond. After Matt mentioned Karmaka to me last fall, we constructed the Print & Play and Matt showed me how to play while he was in town last year. As we have a tendency to do, we discussed the clever ideas of Karmaka and brought up questions surrounding interesting design decisions. One such question surrounded the idea of “draw a card, then play a card” which can be a bit more cumbersome then the easier flowing “play, then draw”. The latter introduces new information variables as early as possible to allow for maximum planning benefit which would (in theory) decrease collective downtime during the game, as I would have all my options available to me as soon as possible. Seeing as the game is so well thought out, we assumed there must be a strong reason for the design decision to go with “draw, then play”. Dave was kind enough to engage our questions and discussed that during development an edge case could arise in which you had no future life cards, could reincarnate and then had no cards that you could play. Instead of wasting a turn with zero cards (then drawing at the end of your turn), their “draw, then play” approach ensures you always have at least one card at the beginning of your turn. Dave and Eddy have done some very impressive work in Karmaka and we thought this simple design decision was a great example of how thorough and thoughtful they have been in it’s development.